Service robots often mean robots that assist the elderly, or help with the rehabilitation of medical patients. But the range of services that robots can perform is extremely broad. To a telepresence PatrolBot which will let disabled police officers and military veterans serve as distance patrol officers, filling a gap in both the lack of patrol staff, and the lack of available jobs for disabled vets and officers, developed by Florida International University. To a can crusher robot, Dr. R.E. 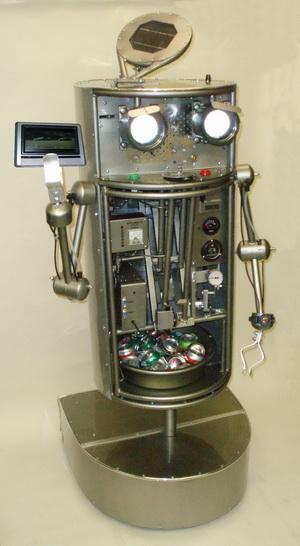 (Robotic Environmentalist) Cycler, from Florida Robotics, which crushes aluminum cans in its chest cavity and compacts them to less than a (presumably cubic) inch in size. 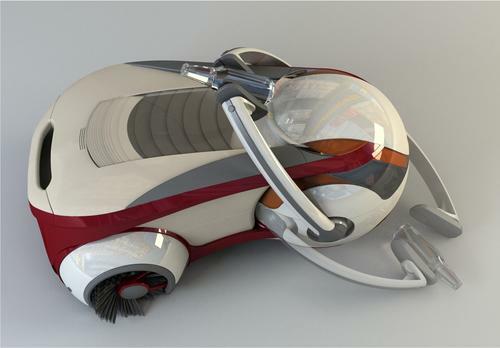 To this new Roomba competitor, the autonomous robot harvester created by Russian industrial designer Olga Kalugina, which collects trash in pedestrian areas such as shopping centers and streets. Georgia Tech’s Golem Krang robot is being designed to emulate the feats of the TV character MacGyver, who could get himself and others out of problematic situations using ingenuity and objects immediately at hand. Aided by an algorithm that will help it reason like a human, Golem Krang will identify items in its environment that can become tools to accomplish necessary tasks, such as stacking boxes to climb over an obstacle, or breaking a window’s glass to escape a fire. 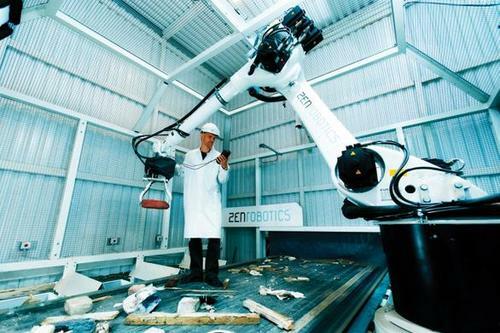 Finnish startup ZenRobotics has designed the ZenRobotics Recycler, a robotic recycling system that sorts and separates raw materials during construction and demolition, commercial and industrial, and municipal solid waste recovery operations. The system is based on off-the-shelf industrial robot components, which are controlled by artificial intelligence and equipped with multiple sensors to safely and efficiently remove materials from a waste stream. 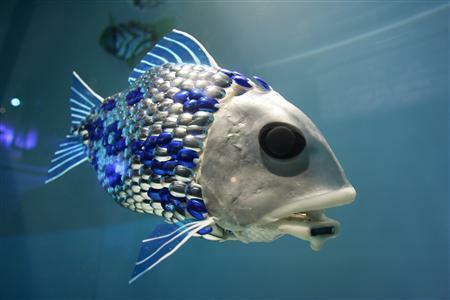 The sensors include visible spectrum cameras, near infrared, and 3D laser scanners that identify the different items, and the robot can learn from its mistakes, producing fewer contaminants in the harvested materials. It can also weigh and measure the items of separated trash, and can simultaneously sort, reclaim, and harvest. 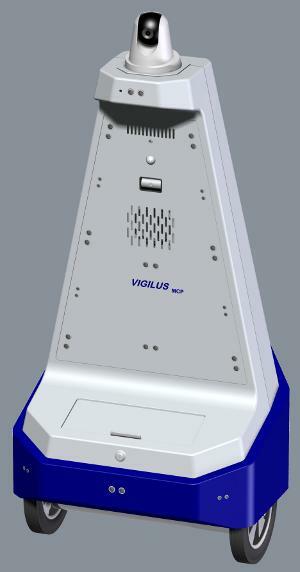 The autonomous Vigilus Mobile Camera Platform, form Vigilant Robots, can be customized to create a robot that patrols interior spaces such as shopping malls, event centers, warehouses, and distribution centers as an adjunct to human security forces. It reports anomalies and sensor readings that exceed preset customer parameters, and can be customized with cameras, sensors, and access control devices. When installed, the robot is given a map of the site to be patrolled, which can be updated to reflect changes in layout, with customizable location names. Its battery lasts 10 hours without degradation. 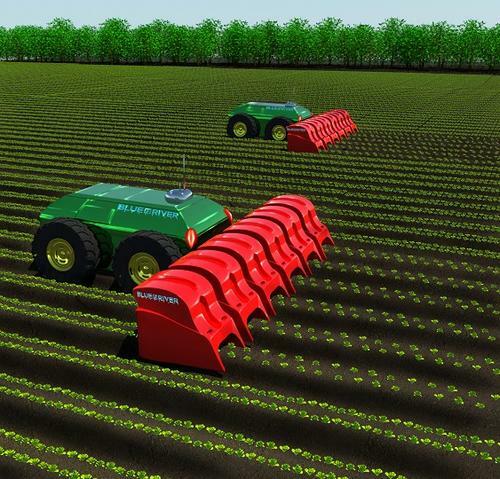 The Clever Robots for Crops (CROPS) project is a multinational engineering effort to design an intelligent robot system with sophisticated sensing and manipulation abilities. It will selectively harvest the produce of high-value crops, identifying not only the correct plants, but fruits and vegetables at the correct stage of ripeness, including greenhouse vegetables, orchard fruits, and vinyard grapes. DeLaval‘s voluntary milking system automates milk production to an extreme degree, letting cows decide when they need to be milked. 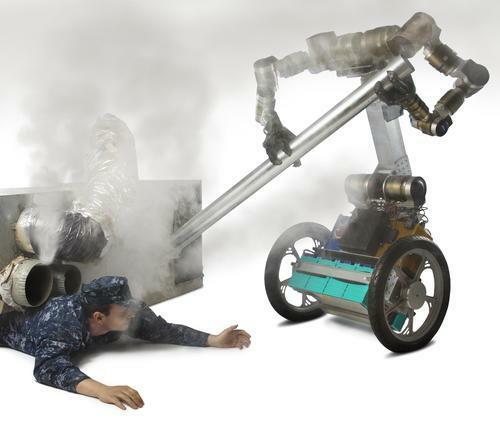 A robot being designed by computer vision and robotics company Blue River Technology will automate the backbreaking labor of weed pulling, eliminating the need to use harmful chemicals to kill weeds. The robotic weeder will employ image sensors in the implement (shown in red), as well as machine vision algorithms for recognizing and distinguishing among different types of plants. September 10th 2012 Blue River Technology raised 3.1 M $. 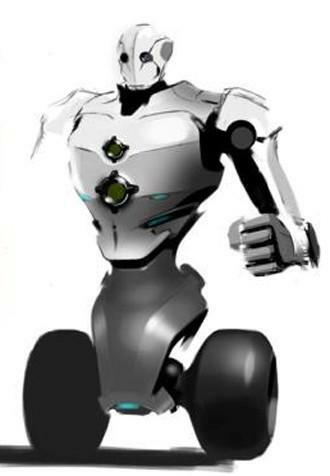 Do you have/know more examples of other companies that have products for service robotics? Please, introduce it as a comment to this post.